Certain painted kitchen cabinets have the ability to give your house a vintage country look. 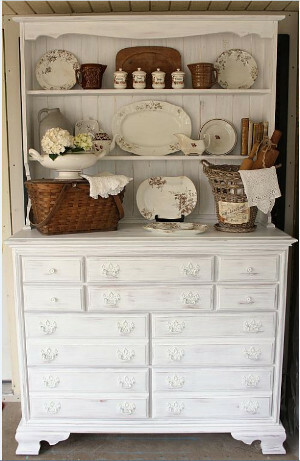 This State Fair Farmhouse Cupboard is definitely one of those kitchen or living room ideas. 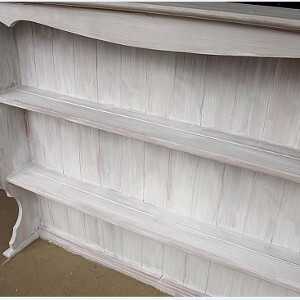 All you need is an old cupboard, and this tutorial will show you how to distress furniture with paint. You'll soon have a special cupboard for all your antique china and linens. You may even be inspired to give more furniture that coveted vintage look. This prize-worthy furniture piece is one that the neighbors will be raving about. You can find this project, and many more just like it, in our new free eBook, How to Paint Furniture: 19 Upcycled Furniture Projects free eBook from DecoArt! Let dry completely between painting steps. Use the cloth to wipe down the furniture pieces to remove dust, etc. Use a 2" flat brush and Everlasting to apply one or two coats to both furniture pieces, painting over the hardware as well as the wood. Once dry, distress the paint with sandpaper to allow some of the original wood finish to show through in areas where wear would naturally occur. For example: around handles and on edges. Wipe down the furniture pieces with a soft cloth or use vacuum cleaner to remove all dust. 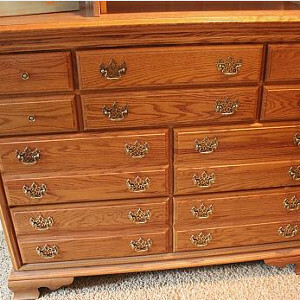 Using a waxing brush, apply an even coat of Clear Crème Wax over the entire piece, including the hardware. When dry to the touch, buff the wax to a smooth finish. 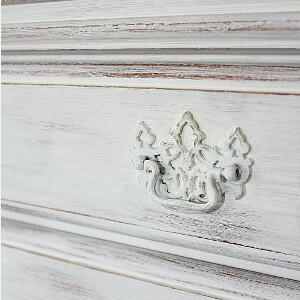 Distressing can also be accomplished with a damp cloth before paint is totally dry/cured. For smooth brushstrokes, paint in the direction of the wood grain. Also, better quality brushes result in a smoother finish. Use inexpensive chip bristle brushes if obvious brush strokes and texture are desired. When waxing, light coats will make for an easier buffing process. I love to use chalk paint to update furniture. Chalk paint is super easy to use and I love the fact that with most furniture pieces, very little prep work is required. I like the way this hutch turned out, the only thing I would do differently is I would not paint the hardware with chalk paint. I might paint it a different color or would change it out completely with something new. Good job!